"Don't wear perfume in the garden--unless you want to be pollinated by bees." 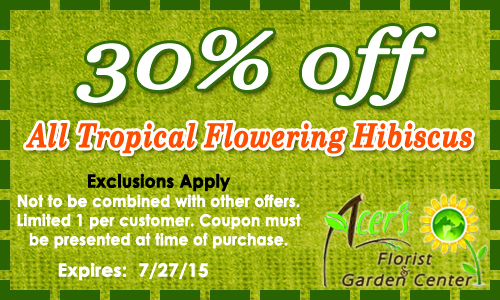 Want to add a splash of tropical pizzazz to your garden? Think hibiscus! 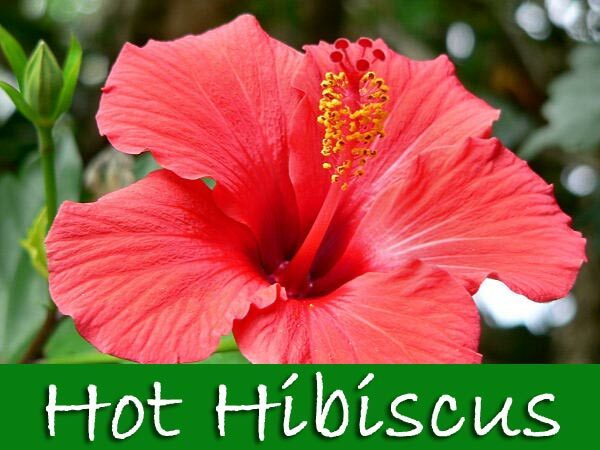 Hibiscus is the one of the flashiest tropical shrubs around! The large vibrant colored funnel-shaped flowers are simply spectacular. The most familiar hibiscus to all of us is Hibiscus rosa-sinensis, originally from the tropical areas of Asia and cultivated for centuries. Hibiscus can be used as specimen plants and are also beautiful when used as a tropical flowering hedge. They bloom in spring and summer with flowers ranging in size from 4-8 inches wide, single or double. Flower colors can vary from white to pink to red, from yellow and apricot to orange, depending on variety. Hibiscus prefer a well-drained soil, rich with compost, full sun to partial shade, and regular water during the growing season. During the blooming period, fertilize the plants every two months with a balanced plant food. To keep mature plants growing vigorously and to maintain an attractive shape, prune out about 1/3 of the old wood every spring. Pinching out tips of stems in spring and summer will increase your flower production. We invite you to visit us soon so we can show you our great selection. The Farmstand at Acer's has a large selection of freshly-picked, locally-grown fruits and vegetables. Stop by today to get the freshest produce around. When designing your landscape, there are many things to be taken into account, including (but not limited to) space, sunlight, pests, and the things that a homeowner would like out of the landscape project. This homeowner wanted to take their existing fence line and add shrubs and flowers, creating a wall of lush green foliage, splashes of vibrant colors, and a wall of privacy from the driveway that passes by the back edge of their property. Some serious challenges came with the design of this project. The large oaks create far too much shade for most plants, and there are deer moving into the area, which would strip many plants down to nothing. Acer's design team choose Skip Laurels and Excelsa Arborvitea. We selected plants that would not attract the ever-encroaching deer population, but also will thrive in the shade of the surrounding full oaks. We created a computer-generated simulation of what the plants will look like after planting, to give the homeowner a good idea of what the project will look like upon completion. Once the design was approved, we sent out our Professional Landscape Installation team to get the job done right. The goal was to create a dense manageable hedge for privacy from the shared driveway, and I think we accomplished it! This hedge will look even better as it grows in, and will require very little maintenance. Do you have a landscape project in mind? Stop by Acer's and our staff of Landscape Professionals will get it DONE RIGHT. GUARANTEED. Place sliced meat into a shallow bowl, and season with salt, black pepper, and crushed red pepper. Squeeze the lime juice over the meat, and turn until evenly coated. Cover, and refrigerate for 30 minutes. In a blender or food processor, combine tomatillos and jalapeños. Purée for 15 to 20 seconds, or until thick. Heat 1 tablespoon oil in a large skillet over medium high heat. Carefully pour in tomatillo mixture. Cook, stirring frequently, for 5 minutes. Stir in beef broth. Transfer mixture to a serving dish. Heat tablespoon oil in a large skillet over high heat. Stir in 1/3 of the beef, and sauté for 1 minute. Top with onions, tomatoes, avocado and cilantro. Garnish with a wedge of lemon, to be squeezed over taco before eating.